We're celebrating more than 30 years of growth within our industry, as well as relationship building with our clients across a wide variety of industries. We've been providing a service for our clients that helps them save money and spend less time on their printing environment. We are a full service print support company and pride ourselves on delivering fast, effective results that save money and time. Save up to 50% off your monthly costs. 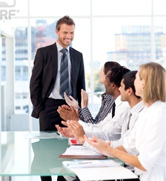 Contact us for a free consultation to find out more. 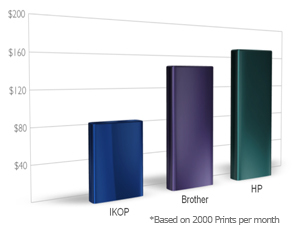 What do all of the printers in your storage facility locations cost you each year? For a growing operation the costs of hardware, toner, drums, maintenance and repairs add up quickly. 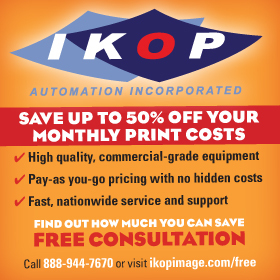 IKOP can help you lower these costs and supply you with commercial grade Ricoh multifunction printers that will: streamline operations, reduce waste, and standardize your office environments. You'll also save time and hassle by working with a single, dedicated supplier with the largest dealer network in the nation. Our nationwide support is always available with fast repair and 24-hour guaranteed replacement to keep your businesses running. The majority of today's offices purchase printers i.e. HP, Brother, Canon etc. from local stores, or on-line for the low cost and convenience. Manufactures deliberately market in this fashion to lure consumers in and generate large profits on supplies. They obfuscate costs with terms like (Declared cartridge yield in accordance with ISO/IEC 19752) clarification toner yield based on 5% coverage on letter size paper. However the majority of our prints use more then 10% coverage, consequently upping costs substantially. Copyright © 2011 IKOP Automation, Inc.